Shanti Sounds Costa Rica is Ayi and Michael Mayzel. We are based in Nosara in the middle of the Blue Zone in Costa Rica. We offer Sound Journeys for groups and individuals. We offer artisan healing instruments for sale, allowing you to bring those healing frequencies into your practice, your home and community to share. 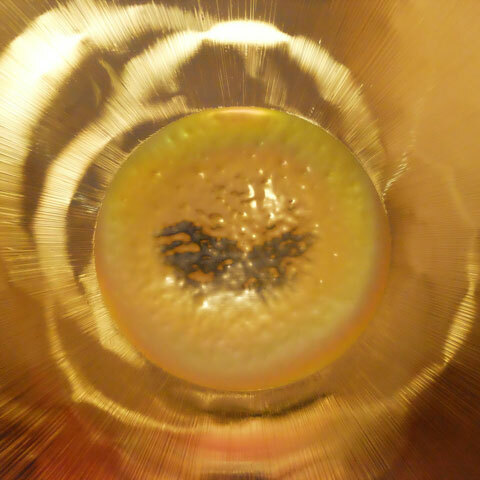 We are the Paiste Authorized Gong Centre in Costa Rica as well as the exclusive Costa Rican distributors of Crystal Tones Singing Bowls, Oetken Gongs, Cristal Mines Lyres and Koshi Chimes, as well as Chakra Chants tuning forks and other unique assorted instruments. We also carry a hand chosen assortment of high vibrational transformational jewelry and beautiful clusters of quartz crystals…all charged by the vibrations of our instruments and land. We are passionate about what we do and feel honoured to facilitate a space for deep relaxation and healing through wholistic resonance. As such, we travel to many parts of the world, seeking unique musical healing tools to share in our Sound Journeys. 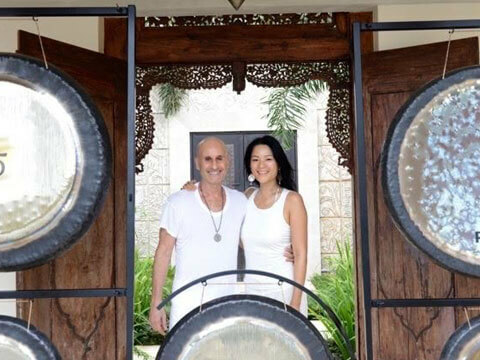 As Shanti Sounds CR, we have toured in Europe, Canada and Costa Rica and offer Sound healing workshops and retreats. We feel it to be our Dharma to share healing sounds with others and to create opportunities for those living in Costa Rica to be able to bring those healing frequencies into their homes. 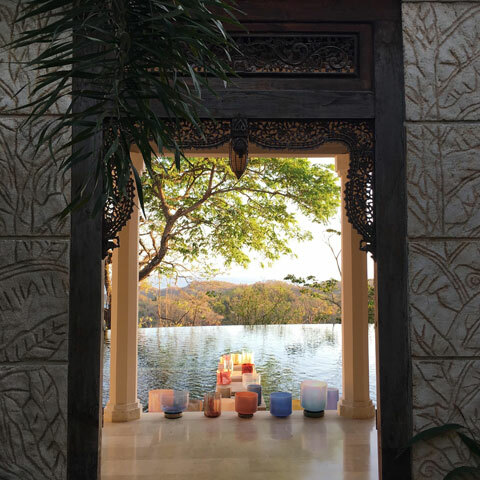 We are located in Nosara, Guanacaste in one of the world's Blue Zones, a geographic area of the world where people live measurably longer and happier lives. The land where our Sound Temple is located was a place of celebration for the Ancients. During an archaeological dig, over 100 musical instruments were found as it had been a land of celebration and ceremony. We feel strongly called and supported sharing Sound Journeys on this special land.…as if it is a new continuation of the old. Monkeys, birds, even geckos are likely to add their energy and voices to the Journeys, as they are plentiful on the land. We feel honored to have been chosen to steward this land. Originally from Amsterdam, Ayi is now partly based in Costa Rica after being called to be of service on this special land. 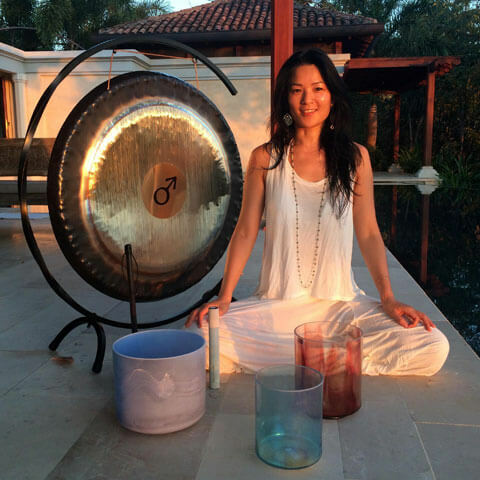 A talented and experienced sound healer, Ayi creates intuitively. Through her experiences with sacred geometry, Mystery School, meditation and as a yoga teacher she connects deeply with the sounds and vibrations of the gongs, crystal bowls, crystal harps, chimes and tuning forks. Michael has been sensitized to the subtleties of sound for much of his life. 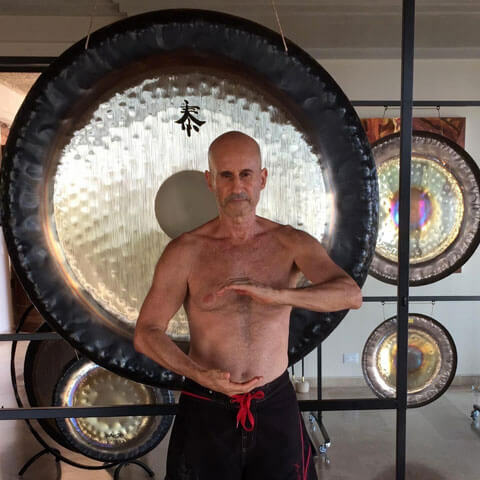 Through his longtime Vedanta practice and as a percussionist, he brings his life's experiences to the joyous creations of Sound Journeys and to the teaching of Qi Gong. Everything is in a constant state of vibration…the planets, the stars, all sentient beings and the non-sentient objects around you. At the deepest level, every one of the billions of sub-atomic particles we call "you" and "me", are in a constant state of movement and vibration. Imagine each sub-atomic particle within you moving at its own speed and dancing to its own rhythm. At a sub-atomic, celestial, and personal level, our experiences are the products of that wonderful and mysterious dance. All matter moves and vibrates at its own frequency. Nothing rests. Your frequency is different from other things in the universe; it is one of the properties that makes you a unique being. Other matter - other people and other things - also have the property of vibrational energy which contributes to our perception of these things as separate entities; This is a person, those are animals, that is a tree, and so on. When you re-conceptualize the world around you as a sea of vibrating particles and frequencies, you also begin to understand the ways in which all things are connected. In that sea of vibration, you are not truly separated - you are in fact living in an ocean of interconnected energy. We all are connected in this way….at the deepest level - a level that professor John Hagelin calls the “unified field”. At Shanti Sounds, we recognise and fully acknowledge the creative power and potential of energy. By using sound and vibration, we ‘massage’ the vibrational frequencies that surround us. We believe that by working with sound in this way, we can have profoundly positive impacts on our bodies and our lives. I have participated in three of Ayi and Michael’s sound journeys...each time it has been a unique and profoundly beautiful experience. The vibrations of the bowls and gongs create an energetic container in which to deeply relax, let go, realign, heal, unwind, go deep, celebrate and transform. Thank you for an amazing, inspirational, creative, multi dimensional, healing sound journey, (just to name a few words to describe an indescribable experience). It was such a blessing to share this journey with everyone!!! Registered Massage Therapist, Victoria, B.C. Just wanted to say thanks for the special treatment in your "healing journey", so profound and lovely. Michael and Ayi's incredible skill, innate sensitivity, intuition and gentleness, made my first Sound Therapy session an amazing & moving experience. Creatively combining a vast array of musical instruments, it was a symphony of vibration that left me feeling deeply relaxed, balanced and curious for more. Thank you for generously sharing your gift & love of music. I look forward to more magical journeys. Thank you so much for a beautiful experience shared.How special, vibrating and enlightening that felt. The Sound Journey with Michael and Ayi left me feeling relaxed, refreshed and rooted. It was as though my entire vascular, muscular and skeletal system had been re-booted. Since trying it for the first time a few years ago I have returned whenever I have the chance with an ever-deepening respect for the healing nuance in this journey of sound.